Cauliflower is a semi-hardy vegetable that grows best in cool weather. It is one of the most difficult vegetables to grow, because it can’t tolerate too much heat or cold. Temperatures should be between 40°F and 75°F. Cauliflower requires nutrient rich soil, and constant moisture to grow successfully. White varieties are the most well-known, but green and purple varieties are easier to grow and have more nutrients. In most areas there is not enough time to grow cauliflower from seeds before the weather gets too hot. Transplants are ready when they have at least 3 true leaves, but not more than 6. Harden off and transplant outside 4 weeks before the frost date. If you live in a climate with hot summers, choose early-maturing varieties to plant in the spring (45-60 days). Start seeds indoors 14 weeks before the first fall frost date, or purchase transplants (if available). You can also plant seeds directly in the garden 12 weeks before the first frost date. Transplants are ready when they have 2-4 true leaves. Harden off and transplant outside 8 weeks before the frost date. Cauliflower requires very rich soil; amend with lots of compost and fertilizer (chemical or organic) at planting and once during the season. It particularly needs boron, phosphorous, and potassium in the soil before planting. After planting it will need at least one application of nitrogen. Keep the soil evenly moist throughout the growing season; apply mulch in dry areas to retain water. If the transplants are too large, the soil deficient, or the temperatures too cold or hot, the heads will “button”–form small heads that never grow and mature. 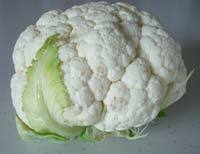 White cauliflower won’t look or taste as good if the head is exposed to the sun. It must be protected from the sun by wrapping the leaves around the head. Most current varieties are self blanching, so you should not have to secure the leaves. Harvest before the flower buds open (they get “ricey”), when the head is still tight. Cut off just below the head.